For checking of the negative influencing of torsion (information) component of mobile phone electromagnetic radiation on a human organism and "Spinor" device defence efficiency we offer to your attention a simple test. To make this easy test we need any two persons. These persons should take away any electronical devices. 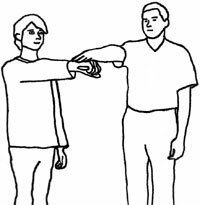 The 1-st participant of experiment takes a mobile phone without "Spinor" device in his (her) hand, levitates the hand ahead and retains in horizontal position (as it shown on picture). 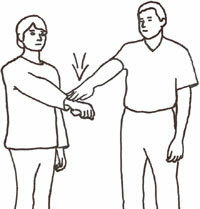 The 2-nd participant presses down on the wrist of the 1-st participant (try to move arm down, as it shown on picture). It is necessery for 1-st participant to resist to 2-nd participant's pressure as strong as possible and both participants memorize the level of resistance of hand. Further, the first participant brings a phone with "Spinor" device stuck on it, holds it in a hand 10-15 seconds and both participants repeat a test. As a result of experiment you will find that resistance of hand will be noticeable higher in 2-nd experiment, when the participant holds in a hand a phone with "Spinor" device. This evidently demonstrates reaction of human organism to negative influence of torsion (information) field of mobile phone. Furthermore, if you make the same test without any mobile phone in hand, resisting level of arm will be about the same as in test with phone with «Spinor» device stuck on it.